As mentioned in The Cultural Synergist May edition Cultural Synergies have been involved in many knowledge transfer projects across various industries and countries over the past few years. In response to our experiences and as a means of sharing some of them, we have written a discussion paper titled 'Cultural Intelligence for Knowledge Transfer Teams'. Although the industries, teams and organisations involved in knowledge transfer projects vary, we see many commonalities in terms of the cultural challenges and practices that arise from the planning phase through to completion and then continue to plague future projects. The discussion paper highlights some of the key challenges that Cultural Synergies has observed; and generates some thinking around what the planning stages need to consider before organisations embark on these projects, along with some practical strategies. It is critical to commit the necessary time and resources to establish the foundational protocols for the �people aspects� and the cultural dimensions that are enmeshed in these projects. Here is a great book written by a woman who lives and breathes cultural intelligence. Julia captures her audience through her many conversations with leaders throughout the world and across a wide network of industries. She has invited them to tell their stories, the successful, the unsuccessful, the personal and the disastrous. Julia asks where are the global leaders and who will be leading the leaders of future. She argues that organisations really need to employ the cultural differences that exist within their global employee pool, rather than try to ignore and flatten these differences. I too find myself regularly asking similar questions and making similar observations that Julia describes; such as the ability that organisations have in spending billions of dollars developing global brands and organisations but the inability to support and develop the global leaders with CQ who are going to run them.
" 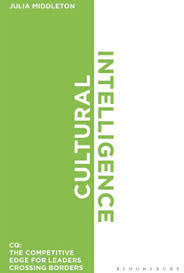 Cultural Intelligence. CQ: The Competitive Edge for Leaders Crossing Borders." By Julia Middleton (2014).